5 Tips On Living A Beautiful Life! 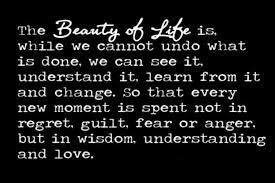 How can you really live a beautiful life? What are you willing to let go in order to gain the life you deserve? What are the keys to living a life based on beauty? Well, you are probably wondering what are the answers to those questions. I can honestly tell you that living a beautiful life begins with cultivating a beautiful mind. In the last month, I have focused on filling my life with beautiful things to see, hear & speak. I have spent time celebrating beauty in a different kind of way. I decided not to watch, speak or listen to anything that did not display beauty. In this time of beauty I found out that life is a lot more beautiful than what we choose to see, hear or speak. When it comes to living a beautiful life you have to be intentional. If you lack intention you will continue to see, hear and speak about all the things that is wrong with life. As I grow day by day I realize life is what you make it and if you choose to make it miserable then you will be miserable. Misery loves company, the more you feed it the more it will gain energy. The greatest question you can ask yourself is what am I giving energy to. I found myself in the last couple years giving energy to things that were irrelevant. I made situations bigger than they really were because I invested too much time into over analyzing. I can now honestly say that creating a beautiful life is solely up to each of us. Make a mental inventory of where your your energy is going. Find out if the energy has produced the right fruit you desire in your life. If not, refocus on new things that will serve you in a positive way. Everyone deserves a beautiful life so below are a five tips to help you start your journey. 1) Stop over analyzing. I can admit this is one of my huge problems and over analyzing creates problems that were never there. In order to stop over analyzing let go of what you cannot control, stay focus in the present moment and know God is your ultimate source. 2) Be mindful of where your attention goes. Where your attention goes so does the flow of your energy, so be mindful of how you interpret things & react to others. 3) Other people issues are not your emergencies. Yes, you want to be the hero for everyone but you will exhaust yourself trying to be everyone she-ro or hero. Do not let other people emergencies become emergencies in your life. 4) Don’t take it personal. I know this is a hard one but stop taking what people say or do personal. What others say or do are not a direct reflection of what or who you are. What they don’t say or don’t do is still not a reflection of the brilliant person you were called to be. Be confident . 5) Self-Love. Fall in love with who & what you are no matter your flaws. In a perfect world we all are flawless but in the real world our imperfections is what makes us unique. P.S. To make your life even more beautiful you can now purchase my eBook to get five essentials tips to help build your self-confidence.